One of the things I love most about Weddingbee is that you have an opportunity to learn from other brides. I vividly remember reading Mrs. Hen's post on picking a wedding date and how Pride caused issues with getting a room block and mentally noted that I would need to make sure I did my research. When we picked our date, I did a quick search and nothing came up in Muskoka the weekend of our wedding. I figured I was good to go. When it comes to planning, we were quick to book our major vendors since once they're booked, they're booked. One thing on those early checklists that I had been patiently waiting to do was room blocking. I figured since my guests wouldn't be booking until the new year and there were about five possible hotels in Huntsville to choose from, we'd be golden. I didn't want to be the crazy bride calling too early. Momma Narwhal is a Rotarian, and one of her fellow Rotarians runs a hotel in town, so I figured I'd do a room block with him. Check it off the list. Easy peasy lemon squeazy. I think you get where I'm going with this. Sometime in the early fall I emailed my mom's fellow Rotarian and he politely informed me that I wouldn't be able to do a room block because the Ironman triathlon will be in Huntsville that weekend. I think you can pretty well picture my face. I don't exactly know how I missed this, but I did. Fortunately for us, we only have about 22 rooms that need to be blocked. This includes Mr. Narwhal's family and friends that are coming from the other side of Ontario (15+ hour drive) and my family coming from the Toronto area (2+ hour drive). Most of the hotels in Huntsville have reserved room blocks for the 3000+ people coming to our community for the Ironman. Every hotel was already sold out, required a two night minimum stay or had increased their prices by at least 50% and nobody was willing to offer me a small block. 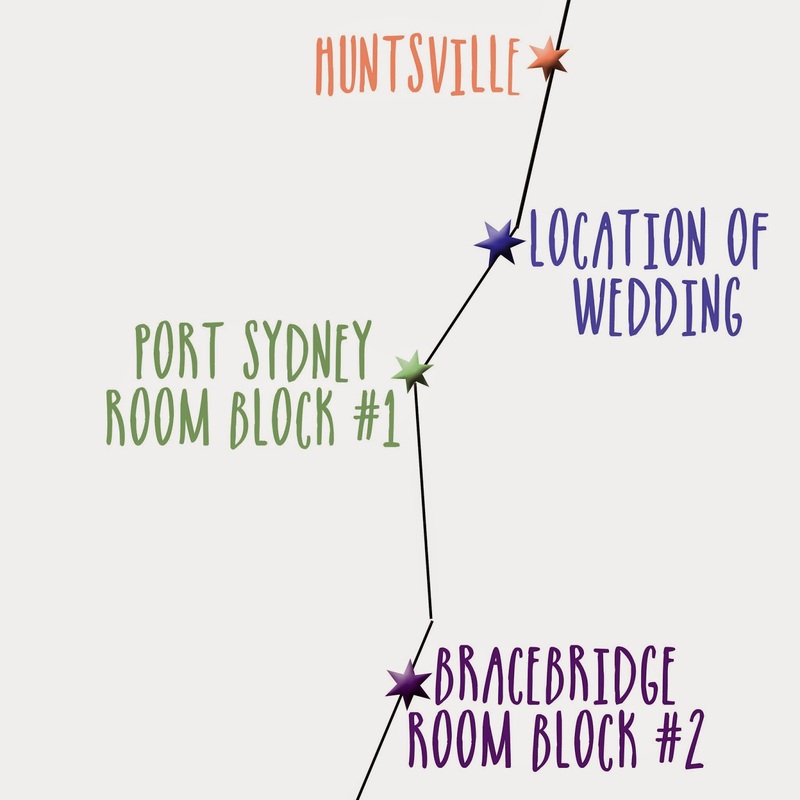 After what seemed like months of emailing tag with a seasonal inn close to our home in Port Sydney (we live between Port Sydney and Huntsville) we were able to secure the entire inn of 14 rooms for the wedding. They asked for a two night minimum, and Mr. Narwhal and I decided to prioritize his family coming for a few days from the Thunder Bay area and a few of my work colleagues. This left us with a remaining seven potential rooms that we needed to find for my family. This issue became one of those things where instead of dealing with the problem I procrastinated and ignored it. Sometime in February Mr. Narwhal's mom was visiting and we drove past a little motel in town and she asked if we had tried there yet. I said no and that I had completely forgot about it because they didn't have a webpage. The next week or so I called the motel and miraculously they had rooms! Hallelujah! She was a bit apprehensive to give them to me, and said she would call back. I waited, and no response. A few weeks later I called her back and she agreed to give them to me for a maximum of one month. I asked if I could come check them out and she said anytime and I said I would be there in the next week or so. This had been our biggest wedding planning obstacle thus far and it felt so good to finally have it sorted out. Things got a bit kerfuffled in my schedule, and the next week I asked Mr. Narwhal to stop in and snap a pic of a room so we could send it out to my family and ask them to book as soon as possible to ensure they had a room. Later that day my phone lit up and it was Mr. Narwhal. After exchanging hello's he quietly said, "You're going to be upset." As my stomach sank (naturally thinking something terrible had happened), he proceeded to explain to me that the lady at the motel was extremely rude and completely lost it on him for me sending him instead of going myself and taking too long to visit (even though it had been less than a week). While biting his tongue, Mr. Narwhal politely told the lady that he was disappointed with her customer service and we would no longer be requiring their motel. As she started back peddling he left. I completely agreed that this was the right decision, as I did not want to send my family there only to be treated poorly. At this point, I decided it was time to resort to Plan Z: another town. I've mentioned before that Muskoka is a district with many small towns, and we live closest to Huntsville with about an 8 minute drive. Bracebridge is the next town over and is about 20 minutes from our house. So, after failing on the Huntsville front, it was time to get a hotel in Bracebridge for my family. Not ideal, but it was what we were left with. A visual of the rough distances between locations. Fortunately, this was as easy as a phone call and emailing my family to get their rooms as soon as possible. The hotel we landed on didn't provide a block, but had more than enough rooms left. Since we're providing a shuttle, we have asked my family to drive to the ceremony, and offered to have the shuttle available take them back at the end of the night if they would like. Many have told me I could have just left this one to our guests; however, I felt really committed to doing the legwork for them. I wanted it to be a simple process for everyone, and given the Ironman debacle, I knew it would be easier for me to do it for everyone else. So far, this has been the only part of planning we've encountered that caused us some panic. We were getting pretty worried that our guests would have nowhere to go* and while it took months to resolve, we finally came up with a solution! So my dear bee friends, if you didn't learn it from Mrs. Hen, learn it from me. Do some research on your wedding date if you're going to need a place for people to stay before you officially set your date. Did you have any issues with a room block? *Our local family guest rooms are already occupied by other out of town family that were not included in the rooms we needed to be part of the block.